The TP-LINK 8 10/100/1000Mbps Desktop Switch TL-SG108 provides you an easy way to make the transition to gigabit Ethernet. Increase the speed of your network server and backbone connections, or make gigabit to the desktop a reality. Moreover, TL-SG108 adopts lower power consumption design. With the innovative energy-efficient technology, the TL-SG108 can save up to 72% of the power consumption, making it an eco-friendly solution for your home or office network. 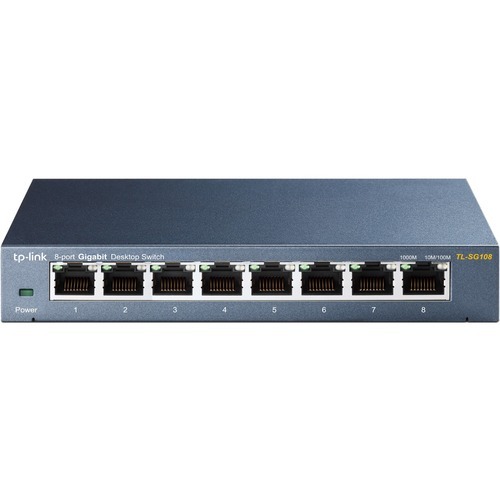 Gigabit Switch Featured with 8 10/100/1000Mbps ports, TL-SG108 greatly expands your network capacity, enabling instant large files transferring. So?power users in the home, office, workgroup, or creative production environment can now move large, bandwidth-intensive files faster. Transfer graphics, CGI, CAD, or multimedia files across the network instantly.